What is the outlook for interest rates in 2019? | City A.M.
What is the outlook for interest rates in 2019? I am an Investment Specialist at Schroders. Concern over the outlook for US interest rates was one of the dominant themes of 2018, especially as the year progressed. President Trump got involved in the debate, tweeting in December that it was “incredible” that the US Federal Reserve (Fed) was considering raising interest rates again. Despite the pressure from the president, the Fed did raise rates in December as expected, to a range of 2.25-2.50 per cent. At the same time, the Fed changed its projections for interest rates in 2019. The US central bank now expects only two further rate rises, whereas previously three more were anticipated. This is due to lower economic forecasts, with the Fed revising its 2019 GDP growth forecast down to 2.3 per cent from 2.5 per cent. However, since that December meeting, the Fed has grown more cautious. Schroders Chief Economist Keith Wade says “it looks increasingly likely that the Fed will pause in March.” The Schroders Economics Team previously forecast two interest rate hikes this year but now expects just one more. The table below shows the market implied rate for US interest rates by month in 2019 and suggests the market is not expecting any further US rate rises. 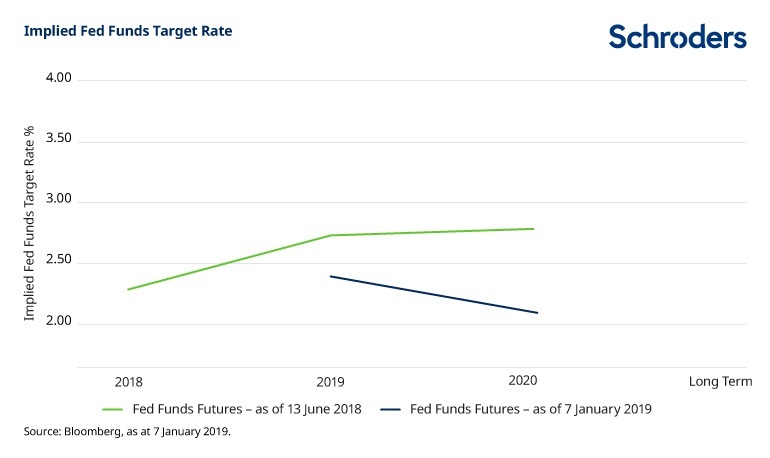 This is a change from mid-2018, as can be seen from the chart, which shows the market’s expectations for US rates as of June last year (green line), compared to the current expectations (blue line). The forecasts included should not be relied upon, are not guaranteed and are provided only as at the date of issue. 1 January 2019 marked 20 years since the introduction of the euro. 2019 will also see current European Central Bank (ECB) President Mario Draghi step down, with his successor likely to be named after the European parliamentary elections in May. In terms of the rate outlook, the ECB has said repeatedly that interest rates will remain on hold “at least through the summer of 2019”. The Schroders Economics Team is forecasting interest rates to rise twice, in September and December 2019, which would take the main refinancing rate to 0.5 per cent at the end of the year (from 0.0 per cent now) and the deposit rate to zero (from -0.4 per cent now). The main refinancing rate is the interest rate banks pay when they borrow money from the ECB for one week. The deposit rate defines the interest banks receive – or have to pay in this current era of negative interest rates – for depositing money with the ECB overnight. The table below shows the market implied rates for the deposit rate. As for the US, these market implied rates suggest little change to interest rates. The table below shows UK rates at 0.91 per cent by year end, sixteen basis points higher than the current level. This suggests markets think a rate rise is more likely to happen than not, but a full rate rise would usually be 25 basis points. More clarity on UK rates is likely to emerge as the Brexit process progresses. In Japan, inflation is still far short of the 2 per cent target, meaning rate rises are a distant prospect. The Schroders Economics Team expects short-term Japanese interest rates to be kept on hold at -0.1 per cent until late 2020. Meanwhile, the Bank of Japan is grappling with the side effects of prolonged monetary policy easing; the central bank now owns one half of the Japanese government bond market. For China, slower global growth and intensifying trade wars could see the central bank ease monetary policy in 2019. The Schroders Economics Team expects the lending rate to fall from 4.35 per cent in 2018 to 4.00 per cent at the end of 2019. Emerging Markets Economist Craig Botham adds that “the reserve requirement ratio is likely to face another 150 basis points in cuts, at least, from current levels”. The reserve requirement ratio is a central bank regulation setting the minimum amount of reserves that must be held by a commercial bank. Cutting the required reserves means more capital is freed up for banks to lend out. Outlook 2018: Another good year for investors?